The Rite of Christian Initiation of Youth (RCIY) is a process that prepares youth and young adults to receive the sacraments of Christian initiation (Baptism, Confirmation, Holy Eucharist). The RCIY team journeys with youth between the ages of 13 to 23 who are keen to learn more about the Catholic faith and seeks to help them establish a relationship with God and become lifelong and joyful disciples of Jesus Christ. At SFX, the RCIY Team comprises adults and youth who work collaboratively to take on different roles. Recognising the diversity of gifts that are present in the body of Christ, members of the team function as catechists, facilitators, sponsors or companions to non-Catholics who decide to embark on the faith journey. …then this ministry may be for you! At present, RCIY sessions are held on Sundays from 10.15am to 12pm at the Good Shepherd Room. Each week, we gather to pray, learn more about different tenets of the Catholic faith and share our lives. The community is made up of catechumens who are journeying towards Baptism, catechists who share the faith and facilitators and companions who share their personal life and faith stories. You are welcome to join us, regardless of whether you wish to learn more about the faith, serve the community or share your faith with others who do not know Christ. 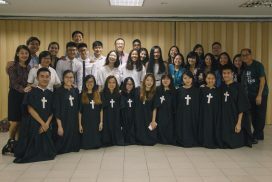 For enquiries, you may write to the team at rciy@sfxchurch.sg or leave your name and contact with the Parish Office.